On Friday, Sprint’s new CEO, Marcelo Claure, said during a company-wide town hall that we should expect major pricing changes for his company’s wireless plans come today. He has delivered by announcing that Sprint will now offer a family share data plan with up to 10 lines and 20GB of data for $100 (line access charges gone through 2015). For that amount of data, you are looking at prices that certainly cut under AT&T and Verizon. The details in this one are all over the board and include a special 2GB per line bonus for a limited time, so hang with me while I update this post and break it all down. Starting August 22, for $100, you can jump on over to Sprint, pick up a family shared data package for up to 10 lines and get 20GB of data. Now, the press release for this states that your monthly bill would be $100, which means that Sprint is waiving phone access fees for a limited time. Think about that for a second. From August 22 through September 30, if you switch to Sprint, you can grab a 20GB data plan that can be shared across up to 10 lines and pay just $100 per month. You can have 4 or 5 or 6 lines too, and still just pay $100. Sprint is waiving the $15 line access fees with this deal through 2015. Once that promo ends and you have to start paying line activation fees, the prices will go up a bit, but Sprint’s data packages are virtually double AT&T and Verizon’s. For example, if you have a family of 4, all of which have “non-discounted phones,” and choose the 20GB $100 data package, your bill would actually be $160. You are looking at $100 for the 20GB of data, plus $15 per line that isn’t on-contract or is “non-discounted.” If you choose a data plan that isn’t at least 20GB and $100, your “non-discounted” phone line charges jump to $25 per line. If you have a phone on contract or “discounted,” those line charges go up to $40 per line. The rest of the data packages carry around double the data of Verizon and AT&T’s competing plans. 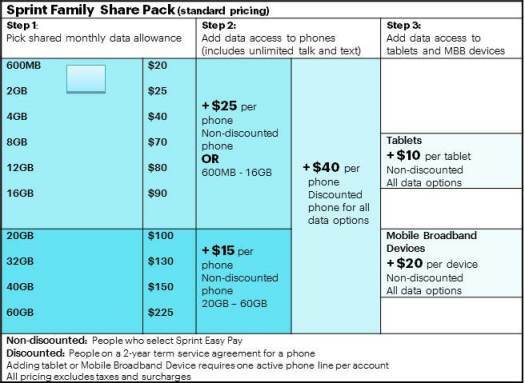 For 20GB of data on Verizon or AT&T, you are looking at a data package that costs $150. Even an option like the 12GB $80 data package doubles the offerings of others. If you were to pick-up a 10GB plan at Verizon and add four lines, you would pay $160 as of today – same deal at AT&T. T-Mobile’s runs $100, but that data is not shared and is instead distributed evenly between lines. 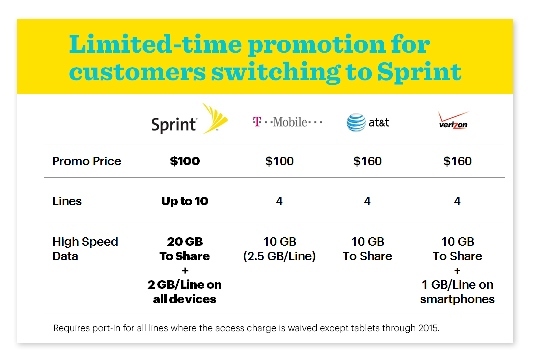 To sweeten the deal, Sprint is giving an extra 2GB of data per line on top of the 20GB. If you were to have 4 lines under your 20GB plan, Sprint would hand you an extra 8GB of data per month. If you maxed out at 10 lines, Sprint would give you another 20GB of data to use, bringing your monthly total up to 40GB. If you decide that this deal sounds amazing and want to leave your current carrier for Sprint, they will buy you out of your current contracts and pay you with a Visa prepaid card worth up to $350. Thoughts? Tempted to move on over or do you still not trust Sprint’s network?